In 2014 we took a family holiday to Hong Kong to take our 3 kids aged 5, 7 & 9 to Disneyland. We struggle to find reasonably priced accommodation due to the fact that we need 2 rooms as hotels rarely accommodate 5 in one room. This means that we also have to pay 2 full room rates. This means that a 2 week holiday would cost the same as a 4 week holiday for those with only 2 kids. A friend at work suggested we used AirBNB Hong Kong to help us cut down the costs of accommodation. I’m so glad I did! I wanted to be based in Tsim Sha Tsui (TST) on the Kowloon side, this is where I stayed last time and I felt I knew my way around pretty well. I searched a number of properties and found one located Granville Rd right in the centre of Kowloon. The apartment was ideally located but the information provided in the posting said it was only suitable for 4 people. I contacted the owner and asked if it was possible to have 5 people in the apartment but the children are very small. The owner replied and advised it was up to me but did highlight that the apartment is very small and he wouldn’t advise we did so but if we felt we could manage he was happy to let us have it. Craig and I discussed it further and decided that we would be spending very little time in the apartment and if we could save money on the accommodation the money would be better spent on other things. So I contacted Tu and advised that we would be able to manage and we would love to stay in his apartment. For me the main attraction was the location, it was right were I wanted to be and only 3 blocks walk from my sister & brother-in-laws hotel. The apartment was approx. $90AUD per night, for all of us. We would not have been able to get a hotel anywhere in Hong Kong for this price and then we would have to pay for 2 rooms. This apartment was also right in the middle of TST not far from the corner of Nathan and Granville Rds. We had some much we wanted to do in Hong Kong and we knew we would not be in the apartment other than for sleeping. I knew the kids would be exhausted after Disneyland, Ocean Park, Macau day trip and the Victoria Peak Tram just to name a few, so accommodation was something I was happy to skimp on whilst in Hong Kong. Tu had provided me with details on how to get to the apartment before we left Australia, we were instructed to get the A21 bus from the airport and then get off at stop 26 on Nathan St. Tu was going to meet us at the bus stop and help us with our luggage and show us the apartment and how everything works. There was a small communication breakdown over the bus arrival time in Nathan St, due to me relying in Wifi but being in Hong Kong, Wifi was easily accessible and the disaster was averted. As he confirmed, Tu met us very promptly and helped us with our suitcases and the apartment was less than a 5 min walk. Now I do have to admit that I may have bitten off my nose despite my face a bit here as I was told the apartment was small. In the excitement of saving a huge amount of money I may not have considered that Hong Kong small is much smaller than Aussie small! Craig and I were a little surprised about just how small the apartment was but you know what, for 5 nights we made it work. We were very rarely in the apartment and we only ever slept there and it served its purpose very well. What I must highlight here is that our kids are exceptionally small for there ages so this made it very manageable for us. If the kids had been any older would not have been able to fit. The apartment was exactly as expected from the photos on the website and it was clean and tidy. 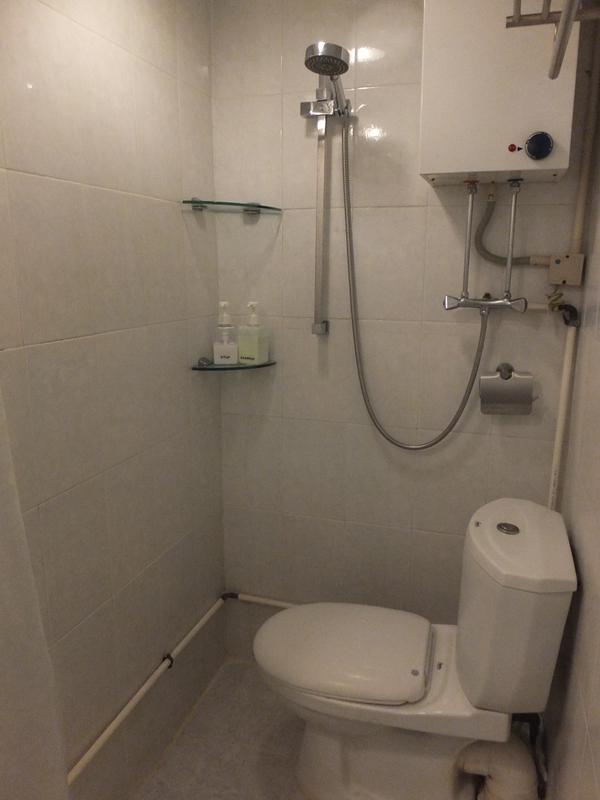 The bathroom was small but functional, I’m not sure if this is common place in Hong Kong as I have never seen it before but the shower was over the toilet which meant that everything go wet then you had a shower. I expected that this was going to be a nightmare and it would remain wet all day but the whole bathroom was dry every evening when we returned to sleep. So that was a relief, it was actually really hot whilst we were there and incredibly humid. The bathroom, clean and tidy. There was a main bedroom which had a double bed in it and enough room for our suitcases, all 4 off them. Please note the photos were taken as we were leaving as I thought I should take some in case I wanted to do a post about – you can see I’m new to this! There wasn’t enough room for all the suitcases to lie around open but this did encourage me to be tidier as there wasn’t room for things to be flown around. I would open the cases get out what I needed and then zip them up again and put them away. It also meant that the kids weren’t able to get into them and pull stuff out all the time. I also used packing cubes this time which were awesome, I cant recommend them highly enough. We got ours from Kathmandu and if you get them on special like I did, they are often 3 for $25AUD. Mental note for next time, take photos before we move in! The kids slept on the pull out couch in the sitting room. 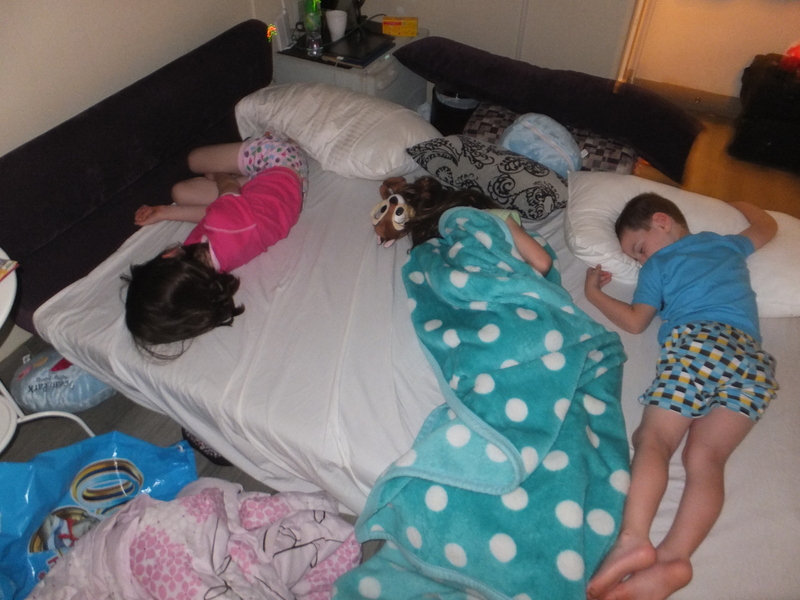 At first we thought how is this going to work but the kids were so exhausted every night they pretty much fell asleep within 30 seconds of their little heads hitting the pillow! I think had they not been so tired it might have been somewhat more difficult. I must admit though that first night both Craig and I were thinking we were going to have a sleepless night with them bickering and kicking and carrying on but honestly, there was none of it! We were up each morning getting ready and you know what I find with kids, less room less mess! So it worked for me on this occasion! The kids pull out couch by day. This is how we rolled at night! The apartment also had quick wifi which enabled us to FaceTime home which meant that nan and pop got to relive the excitement each night whilst it was still fresh in the kids heads. My sister was staying in a 5 star hotel a couple of blocks away and they wanted to charge her a ridiculous amount to use wifi in her room. So much so that they gave it a miss. There was also a small fridge for milk and water and tea and coffee making facilities within the room. There was also towels and bedding for the pull out couch. There was air conditioning in both the bedroom and sitting room which we turned off when we left and it worked well and cooled the rooms down very quickly when we returned and put them on, there was no need to leave them running whilst out. The location was awesome, located right across the road was The One shopping mall with everything you could possibly need. There was a Starbucks right next door to the building where we had breakfast most mornings. There was also a 7/11 right around there corner were we could get water, top up our Octopus cards and they even sold beer, Craig would grab a couple of the evening to have whilst getting the kids organised for bed. It was also one block from the TST MTR station which is really central to everywhere you need to go. Exactly where I wanted to be. This apartment would be perfect for 2 adults and 2 kids, just like that post advises! I could not recommend Tu and his apartment any more highly, its in the prefect location, its clean and tidy and the apartment building was very quite. I think we were the noisiest people in there. I also need to highlight here just how much money this saved us which meant it could be spent on other things, like spoiling our little rat bags and also meant that we were able to afford a stay at Shangri La Tanjung Aru for 5 nights at the end of the holiday when I celebrated my 40th birthday. So would I do it again? Yep sure would, its one of the perks of having exceptionally small children! Have you ever had an experience like this were you have been concerned but it all turned out ok? Leave your comments in the box below and you can also subscribe to our blog to keep up to date with what else we get up too. Glad you had a good Air bnb experience. I can imagine your reaction regarding Aussie small and HK small – haha! Yes it was a wonderful experience and the location was just perfect. Believe me, it was small on another level, but we managed! All adds to the experience! I love AirBNB! First because it’s cheaper but also you get a much more local experience. And I feel the same – I would rather save money on fancy accommodation and spend it on doing more stuff or staying longer – accommodation is usually just for sleeping in for us too. I must bookmark this – would be an ideal apartment for us (just one son). Hi Amanda, this apartment would be awesome for three people and ridiculously cheap in a place that is known for being very expensive for accommodation. The location was great and it had everything we needed very close to where we were staying which is handy. I am now a big fan of AirBNB as hotel accommodation wouldn’t go far on our budget. Tu was an excellent host, he even sent me messages of where to steer clear from as we were there during the democracy protests in October (must be said that we wouldn’t have even known about the demonstrations if we hadn’t seen the media hype in Australia before we left). My sister in law recommended Air B&B and we’ve just been looking into it for an extended family trip to France next year. There are some amazing places there! Hi Bec, yes there are some quirky interesting places. So much cheaper than hotels, especially when you have more than the nuclear family of 2 adults and 2 kids like we do. Airbnb saved as a fortune, you won’t be disappointed. France will be lovely, I’m very jealous! Thanks for this review. As a travelling family now of 5 I am discovering the joys of trying to book hotel rooms; mine are at least small enough – for now – that we can easily bunk together. Keep these helpful reviews coming! Hi Keri, yes once you have to start paying for 2 rooms it does become really expensive. Unfortunately they very rarely let us bunk in even though our kids are quite small. Airbnb have made travelling a lot more affordable for us and we will be using them regularly going forward. Its a shame that hotel chains haven’t tried to cash in on the market and have rooms that accommodate 5 people, especially cruises. Maybe one day they will realise there’s a big market out there that they are missing out on. Happy travels Keri. Certainly was a great price, saved us a fortune. I tried to get something for Australia Day long weekend in Sydney and couldn’t get anything in a decent price range, which was surprising. In fact I think its fair to say that prices have increased quite significantly and within Australia I don’t know that its such a good deal as overseas. Let me know what you think when you do use them, I would be keen to hear. Great blog! I think I booked the same apartment for my upcoming stay in HK this year. I’m a newbie at airbnb, and I’m thankful to have read your blog for your review of the place. Thanks! Regards from Manila! You will love the apartment, make sure you have a giggle when you contemplate how we managed with 5 people in there! The shopping complex across the road The One building has some great restaurants on the 4th floor. Say hi to Tu for us. The location is awesome, would love you to report back after your stay and tell me if you liked the place. Have fun in HK, its a great place. I am sure you will enjoy a long relationship with Airbnb, its the only way for us to go now. I must admit I was a bit worried after I had finished booking the apartment but Tu had been very prompt in replying to my questions. I will be there with my mom, my 6year old son and a teen cousin, I think the apartment will just be perfect for us. As you have said, it’ll only be for sleeping at night since the rest of the day, we’d be exploring the City. Thanks again for your valuable insights! Will definitely say Hi to Tu for you! 🙂 Thanks, Sally! My 3 girlfriends and I are planning a HK holiday in January. The location of Tu’s apartment is exactly where we want to stay. This will be my first time to use air bnb – would you mind guiding me on how to book Tu’s apartment. Thanks for you comment, I would be more than happy to assist you, I’m certain you won’t be disappointed with the location. First thing, you need to set up an account with Airbnb, it requires you to complete an online information segment including uploading your licence/ passport details as well as credit card details. Its all very safe and you shouldn’t be worried about it. Then you will have to provide some information about yourself and then you are free to start booking. I will check my links tonight and see if I can find Tu’s apartment and get back to you with a correct link. I still have his contact details via WhatsApp if I need to contact him. I’m off to work now so will get back to you tonight with that link. Below is the current link to Tu’s apartment, I noticed they have upgraded it a little since we were there, there is a hair drier now and the couch is now another bed. 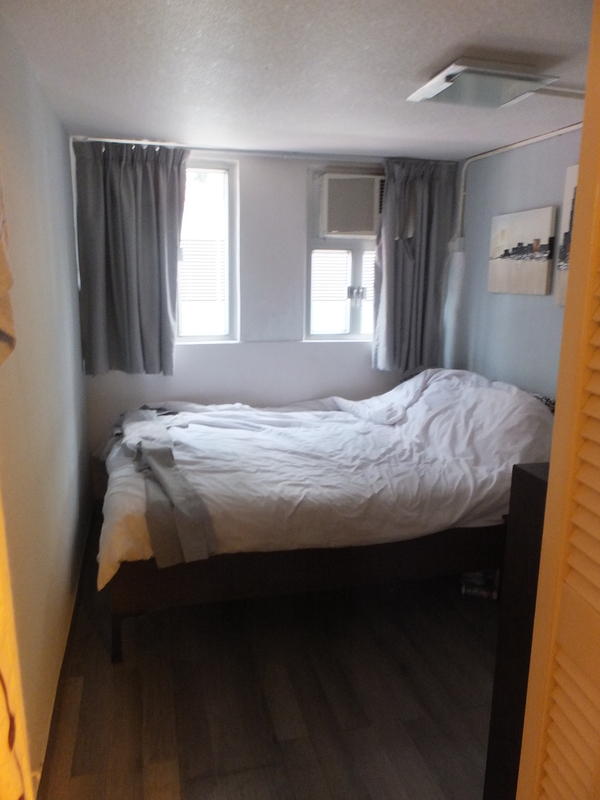 I think you will be very happy with the location, the apartment is very clean and close to shops and TST. I can fault the location, hope you ladies have an awesome time. Hi Sal, I found your blog as I googled Airbnb accommodation in hk. Thanks , we will be looking out for this apartment ??? This apartment is very well priced and very well located. It’s clean and tidy and Tu was really easy to deal with. We stayed there in 2014 so I hope that he is still letting it. It was squishy with 5 but would be perfect for a family of 4 with young kids. I love HK, would love to head back there one day. Thanks so much Sally for your blog! I also came across it by Goggling “AirBnB reviews Hong Kong” – l’m so glad that l did! This is exactly what l needed to know as l have read some recent posts on a travel website that were against AirBnB so that really put me off! But after reading this, l looked into Tu’s apartment and it happened to be one that l have saved in my searches so l will be contacting him. Best of luck with future travels with your family, we may see you out on the road somewhere with my little family! Awww that’s awesome so glad to hear that. We have used Airbnb a number of times & have never had a problem with them. We will be heading to the US next year & will be using them everywhere possible. Tu’s apartment is in a fabulous location, you’ll be very happy with that choice. He’s very easy to deal with also. I hope we do come across each other one day, I’d love to have coffee & chat about our travels. Take care, enjoy HK it’s a cracking city. Thanks for your message.